Enjoying a Sunday Funday isn’t just for couples or groups of friends; families can also get in on the weekend action by taking advantage of the many easily accessible (and affordable!) activities downtown Orlando has to offer. Why brave the theme park zone of Disney and Universal when you’ve got family-friendly entertainment in your own backyard? Here are our picks for downtown Orlando activities that both parents and kids will enjoy, many of which are in walking distance of the condos downtown. Hungry for brunch? You don’t have to leave the kids at home to enjoy this weekend tradition. Dexter’s of Thornton Park is completely kid-friendly, with a thoughtful kids’ menu and killer Bloody Marys for the adults. Outdoor seating adds accessibility for strollers, and the overall vibe is neighborhoody and relaxed. After everyone is fed, consider pushing the stroller up Central to Orange County Regional History Center. Take a tour of the museum’s regular exhibits, like the Pioneer Cracker House where you can churn butter or lay on a moss-filled mattress, or check out the special family activities that explore city and state history through crafts. Bonus: the History Center participates in the Museums on Us program, which grants free admission to Bank of America cardholders on the first full weekend of each month. When the weather is nice (read: October through April), there’s no better way to charm everyone in your party than by spending an afternoon by Lake Eola. If the playground doesn’t entice your kids, the swans will; bring your own bread, but beware, as the bigger birds have been known to get aggressive with little fingers. Turtles nest all along the shoreline, and shady benches are plentiful if you want to take a rest. 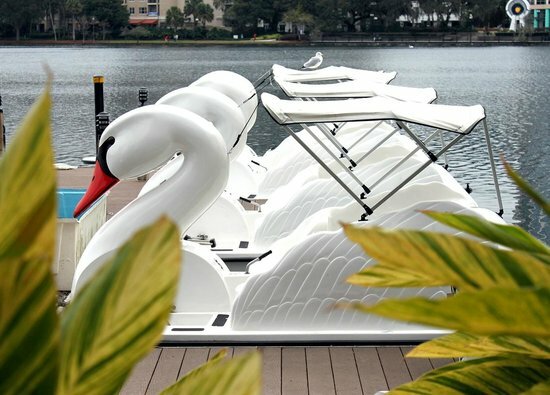 For a swan’s-eye view of the lake, take a paddleboat on to the water, then chill at the aptly named Relax Grill. Lake Eola Park is always BYOB (bring your own blanket), in case the kids want to run around while you engage in some prime people-watching. When the sun goes down, Sak Comedy Lab’s lights come on. Since 1991, local kids have thrilled to the wackiness of Sak’s live improv. Actors use the audience’s suggestions to make up skits and songs on the spot; the earlier shows steer clear of adult material, and your kids are likely to leave humming a silly song or two, their pockets full of free Tootsie rolls. So tell us in the comments: what’s your idea of a perfect downtown day with the kids? Give your fellow downtown denizens suggestions for what we missed! Project Downtown Orlando (Project DTO) is a great initiative that will redefine the next chapter of Downtown Orlando, with all of the things this vibrant area has to offer. Jose ‘Olé’ Mussenden Named Orlando’s HOT 100 Realtor, Again!